Take her to a grassy hill. Take off the training wheels and pedals and lower the seat. Let her roll down the hill, with her feet near the ground to stop her if she wobbles. Get her a balance bike. After some time on the balance bike, she’ll feel what it’s like and she’ll be able to transfer that feeling to the regular bike. Take the training wheels off. Hold on to the back of the seat and run with her as she pedals. When she’s going fast enough, let go. For the past few springs, we’ve tried A and B. This spring, it’s C’s turn. A strategy might work for one person, but not for another. Or in one situation, but not another. It’s sometimes necessary to offer a child more than one in order to accomplish a goal. Once the goal is accomplished, the strategy goes away: the pedals go back on the bike, Mama lets go of the back seat, she rides by herself. We don’t overly focus on the strategy—the strategy is a temporary scaffold. At the end of the day, we don’t care what strategy helps our daughter accomplish her goal—we care that her goal is accomplished. All of these points are important to remember as we teach students strategies for their reading and writing goals. Sometimes, the strategies themselves can get so much attention that we lose sight of why we’re teaching them in the first place. This overemphasis on a student’s ability to articulate the strategy or to demonstrate proof of trying the strategy means that we put the focus on the wrong thing. The fix? Always keep the goal front-and-center by reminding students why we are teaching the strategy. One way to do this is to involve the student in a goal-setting conversation, where they have some say in what they’re going for. 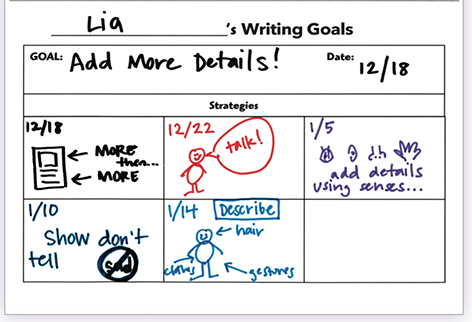 Then, make the goal visible by putting it at the top of a bookmark or form, which will later include reminders of the strategies or how-tos you’ve taught to help the student accomplish the goal. 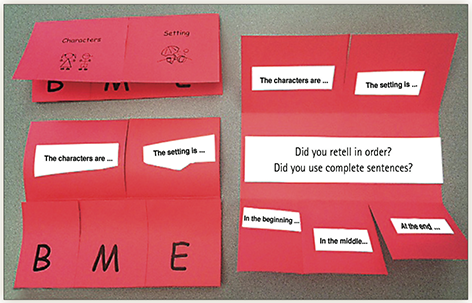 When we keep the goal front-and-center, the retelling “foldable” that we offer them to remind them to tell the beginning, middle, and end isn’t about the foldable itself—it’s about being able to better understand the plot (goal) and to determine the most important events in a retelling. In writing, if we want students to use better structure/organize their narrative (the goal), we can offer them a strategy such as creating a timeline with a problem-problem worsens-solution structure. We hope that in time, the student internalizes this structure and is able to tell or write a story without using the timeline at all. I’ll end with a confession: perhaps bike riding has been more my goal than her goal these past years, and this may be more why the strategies “failed” than anything. This year, she’s asking to learn so with these changed conditions, maybe A, B, or C would work. Nevertheless, this spring, I will hold on to the back of my daughter’s bike seat and run with her as she pedals. I hope that by June, she’s pedaling on her own. If not, maybe we’ll re-try the down-the-grassy-hill option. She’s a year older, and braver, so it might work this time.